Your brother has a hole on the inside of each arm that never quite closes. A blood tap, really, like an oil well for drilling. He is a tall, strong man in his early thirties—an ideal source for plasma. A woman calls his name. She takes his temperature and blood pressure. He gets to skip the full-blown health screening since he’s been coming here twice a week, off and on, for almost ten years. She pricks his finger to make sure his blood is okay today. Some of the other regulars take iron pills for fear they’ll get anemic and be turned away. There’s a weight minimum of 110 pounds, so the smallest, frailest women, sometimes elderly or underfed or both, put on extra clothes or wear ankle weights to pass. A technician wearing a white lab coat, a name tag, and a clear-plastic shield over her face puts a needle in one of your brother’s inner-arm holes. He’s in a “donating bed,” a high-tech recliner of sorts that elevates the legs and leans him way back. Rows of these chairs on the donor floor hold people whose faces he sometimes recognizes. They look at cell phones, magazines, or televisions hanging from the ceiling while maroon fluid drains from their veins. Some of them are homeless. Some of them are like your brother: college graduates with beat-up cars, insurmountable credit-card debt, federal and private student loans. The state university where he worked and borrowed his way through undergraduate degrees is just four blocks away. Plasma centers like to set up shop near universities, where the blood is young and the wallets are light. When your brother finally graduated, the economy was in the tank. As a first-generation college student he had no connections in the professional world, and no one to tell him that communications and history degrees were bad bets to begin with. A good job never turned up. For years he has worked at call centers, leasing agencies, shipping companies. Those paychecks don’t cover basic living costs, though. Thus, his face has aged a decade going in and out of this place by necessity. The plasma center, though, like hundreds like it across the country, always looks the same: the fluorescent lights. The rows of quiet people lying back with one arm hooked to a whirring machine. The white lab coats and the clear-plastic face shields. The signs about what to eat the day before, the day of, and the day after giving plasma in order to keep your strength up. Your brother’s blood follows a tube to a centrifuge that separates out what they want: liquid plasma the color of Mountain Dew. The materials around the place tout the life-saving service he’s providing others; the plasma stripped from his blood will be turned into pharmaceuticals. Very expensive pharmaceuticals, ones he could never afford were he diagnosed with hemophilia or an immune disorder. He doesn’t have health insurance and could use a trip to the doctor himself. The promotional pamphlets and websites call what he’s doing a donation, but it’s really a sale. The buyers are corporations with names like BioLife, Biotest, Octapharma. Plasma brings thirty, fifty bucks a pop depending on how often you go and how much you weigh. Your brother is in the highest weight class, which means he gets twenty dollars for the first donation of the week, forty-five dollars for the second. Sometimes there are bonuses: prize drawings, scratch-off tickets. The place your brother frequents is running a recruitment special: UP TO $400 THIS MONTH. Applicable for eligible, qualified new donors. Fees vary by location. Check with your preferred CSL Plasma donation center to see if they are participating in any other special promotions. Regulars like your brother are already on the donor loyalty program called Z Rewards. The more plasma given, the more points and the higher status they attain—bronze, silver, gold. If you’re away too long, they want you back. “Lapsed donors,” who haven’t given plasma in six months or more, get fifty bucks each for their first five return visits. Plasma is big business, a monopolized industry comprised mostly of five international corporations. 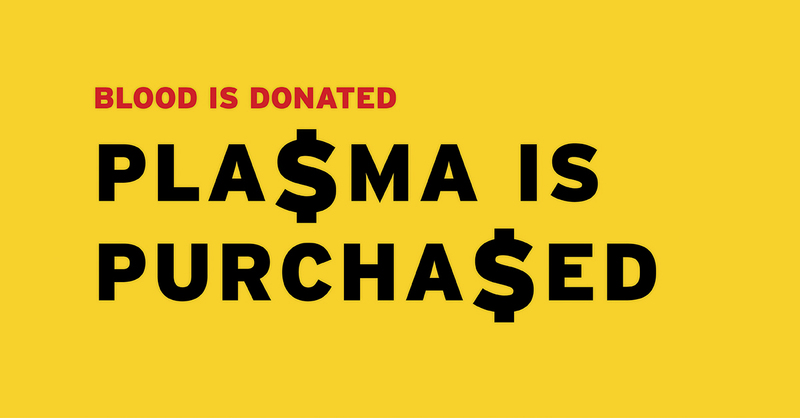 After the 2008 economic crisis, when Americans lost their jobs and homes during the Great Recession, the plasma industry suddenly had a swelling source of eager plasma sellers. New centers popped up across the country, and total donations—transactions, really—nearly doubled in five years, rising from 12.5 million in 2006 to more than 23 million in 2011. In 2008, plasma was a $4 billion industry. In 2015: $20 billion. The sort of drugs made with your brother’s plasma came onto the market during the 1950s and have a grim history. During the sixties and seventies, private plasma companies siphoned their product from the veins of American prison inmates, paying them five or ten dollars a hit. From the late seventies to the mid-eighties, about half of all diagnosed hemophiliacs reportedly contracted HIV from infected drugs derived from the plasma of such a high-risk population. The resulting class-action lawsuits revealed that one company knew it was flooding the market with dangerous supplies. What if your brother came across this information in a magazine while hooked up to the plasma machine? Would he feel a kinship with the US prisoners and the Chinese farmers? As it happens, your brother’s grandpa went to prison a time or two; on the other side of his family he is the first man in generations not to be a farmer. He worked hard to go to college instead of to prison or the fields, but here he is, selling out his veins. If he knew the history of plasma as a product, would he feel afraid for his health, cheated by an economy? Today in regulated markets like the United States, where collection methods are sterile and technology has gotten sophisticated in cleaning contaminated supplies, plasma donation and plasma-based drugs are considered exceedingly safe. On the receiving end, transfusion of whole blood, which enters recipients much the same way it left its donors, is more likely to spread disease. That’s why blood is donated while plasma is purchased: The chance to make fast cash might incentivize disease carriers to lie about their health when showing up to give blood or plasma, but disease would be destroyed during industrial processing of the latter. The Food and Drug Administration thus requires paid-for blood, frowned upon by the medical industry, to be labeled as such. Paid-for plasma, most of which is transported to drug factories, doesn’t have to be labeled. Laws about what body parts can be sold as goods are complicated. The year your brother was born, 1984, the National Organ Transplant Act made it illegal to buy and sell organs. Since a 2011 federal court decision, you can sell some kinds of bone marrow. People in budgetary binds legally sell pieces of themselves for cash every day: sperm, eggs, hair. The poor have long been valued for how much work their bodies can do. Today, the body itself is a commodity. The flow reverses and your brother’s blood, its plasma gone like panned gold, is pumped back into him: red cells, white cells, platelets, sodium citrate mixed in as an anti-clotting agent. Promotional materials insist the process is harmless, but it isn’t always. Some donors, including your brother, get fatigued and light-headed. Occasionally people black out. The anticoagulant bonds with calcium in the blood and, in rare cases, can lead to dangerous calcium depletion. A healthy body rebuilds the plasma that’s been sold, but that takes time. Plasma can’t be given more than twice a week, per FDA regulations. The United States is the only Western country that allows even that frequency, though. Lenient regulations regarding donor wellness and financial desperation amid historic wealth inequality means American plasma accounts for about 70 percent of collections worldwide. The holes that don’t heal in your brother’s arms are in thousands, maybe millions of American arms. He’s your brother because you share a country, an economy, a land, a species. If you met him, you’d probably think he was witty. He’d reach out to show you pictures of his pit bull on his cell phone, and you’d pay little mind to the hole in his arm near his short sleeve. If he were your brother-brother, though, you would know him so deeply that the thought of him laying his arm down to sell what’s in his veins would make you wince. His blood and all its parts would represent to you something that cannot be assigned a monetary value. You’d remember the first time you saw it run down his body. He was two, you were six. You were taking a bath together. Your parents had left the bathroom, so you were alone in the soapy water entertaining him with plastic toys. He tried to stand up and slipped, hitting his face so hard on the side of the tub that it split open the smooth, delicate skin under one of his gray eyes. The cut opened up in the shape of a third eye. The blood that welled out of it was the brightest red you’d ever seen. The damp flesh around it went white. You’d remember the sound of his cry, primal and scared, and how bad you felt—like it was your fault. He had to get stitches. Your mom told the doctor they were sewn too tight in his soft baby skin, but the doctor didn’t listen. She was right. He still has a scar under his eye that looks like the laces of a football. After an hour in the recliner, though, while they take the needle out of his arm, your brother isn’t fretting about what his blood means. He isn’t regarding himself as a precious thing. He isn’t thinking about the hemophiliacs who need medication, the drug corporations that will manufacture it, or the insurance companies that will pay for it after someone pays them. He is deciding what expenses to prioritize with forty-five dollars. On his way to the check-out desk, he takes one of the cookies set out on a tray for staving off nausea. He gets the money he made applied to the prepaid debit card. His first purchase will have to be at the gas station, as the gauge in his beater is below E. When he gets behind the wheel he’ll shake his head to lose the dizziness and pray he has enough fuel to make it to the pump. Sarah Smarsh has covered socioeconomic class, politics, and public policy for the Guardian, the New York Times, the Texas Observer, and many other publications. A frequent commentator on class issues in the US, she recently was a fellow at the Harvard Kennedy School of Government. “The Weight of a Nickel” is adapted from Smarsh’s first book, Heartland: A Memoir of Working Hard and Being Broke in the Richest Country on Earth (Scribner, 2018). She lives in Kansas. I get the point this article is trying to make, but when you have little money and few options, a bad(ish) solution is better than none at all. Donating plasma in college was the only way I was able to afford to eat. It gave me that extra little bit I needed to get by. I am thankful it was available to me as an option when I needed it to supplement my income. Until there is legislation in place that prevents desperate scenarios, I am appreciative of the existance of plasma centers. I have have been a nurse for too many years to remember, and I must admit I did not know that this practice exists. I have administered so many of these medications derived from plasma and I had no clue! I just cannot believe this happens. I know how expensive these medications are! I am left with a bitter taste in my mouth and a sickness in my soul! I go to Octopharma, twice a week lately, because I'm despirate for a little honest income. For the first 6 "donations" I think they give us $ 40 or $ 50 each time, then it drops to a dismal $ 25 for the first time in the week, $ 30 for the second time. When one hits their 6th "donation" in the month, there's a $25 bonus. On your 7th, it's $ 20. On your 8th, it's $ 15. The frequent donor sweepstakes right now is for a $ 5 gift card - not even a $ 5 gift card, mind you, but just the chance to get one. I used to donate blood because I wanted to help people, but I can't afford to give it away for free now. We used to get juice and snacks after donating blood though. Octopharma doesn't give you anything expect a bandage to cover your wound. The hole heals quickly for me, but it always bruises to a lesser or greater degree. If it bruises too much, I'll have to skip the next week. I know to wear a light jacket or shawl, so I'll shiver less when cold saline gets pumped back into my vein after the last cycle of taking out my blood, centrafuging it, and collecting the plasma for processing. In the heat of summer, I enjoyed the air-conditioning and cold saline in my veins. Sometimes the movie playing on the TV screens is good, but once it was the new Robocop, which was really disconcerting. On the screen was a the disembodied head and torso of a man hooked up to tubes and wires, while I and all the other "donors" were also hooked up to machines drawing out our blood and replacing it with blood cells suspended in cold saline. A major theme of the movie is how people can be dehumanized for profit. I thought it was an ironic movie to play at a plasma collection center which also treats people as a resource for making money. I'm one of those people who receives plasma every four weeks because I have a compromised immune system. Although I was aware that I received the plasma from volunteer donors, I was not aware of the variety of donors, especially because of the cost that I pay for the drug that's administer to me. I understand the cost to the pharmaceutical companies, nonetheles, $12,000 per visit compared to $45 to the original plasma donor seems outrageous. It makes one cynical and wanting of a better health care system. How I came to this site I can't remember but am so thankful I did. If Sarah Smarsh's other writings are like this one I will buy all her books. So touching, so insightful on so many levels from such a young person. I will donate when I can. Thank you for appearing on my computer whenI needed a change.